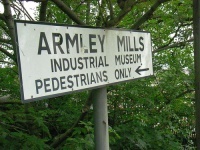 The Armley Mills Industrial Museum was a working cloth mill until 1969, when the City Council turned it into an award-winning industrial museum. In fact, it was once the world's largest wool mill. Exhibits trace the history of textiles, clothing, engineering and locomotive manufacture in Yorkshire. Particularly interesting is a section devoted to the 1920s silent movie projectors, operating water wheels and the huge spinning mules that were in use in the 18th and 19th centuries. The museum has an unexpectedly lovely riverside setting and is the ideal place to learn about the industries that the city of Leeds was built on.